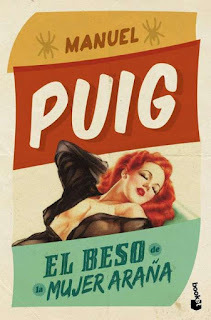 The novel was published in English in 1979 and Puig himself adapted the novel into a stage play in 1983, first being staged in London. Later Héctor Babenco, a Brazilian director, set his sights on developing it as a movie. He initially ran in to some roadblocks due to he nature of the film, and most Hollywood studios were reluctant to back it. It was filmed independently and this movie is probably the starting point for the so-called "independent film" (although, to be sure, there had been a smattering of films before this that were not originally backed by big studio money). An interesting note I found: Burt Lancaster was originally going to play the part of Molina in the movie. According to an article I read on TCM.com, Lancaster was very interested in the character, but it was the one that he saw in the novel. He raised objections as to how the character was panning out in the Leonard Schrader script, and the deal fell through. 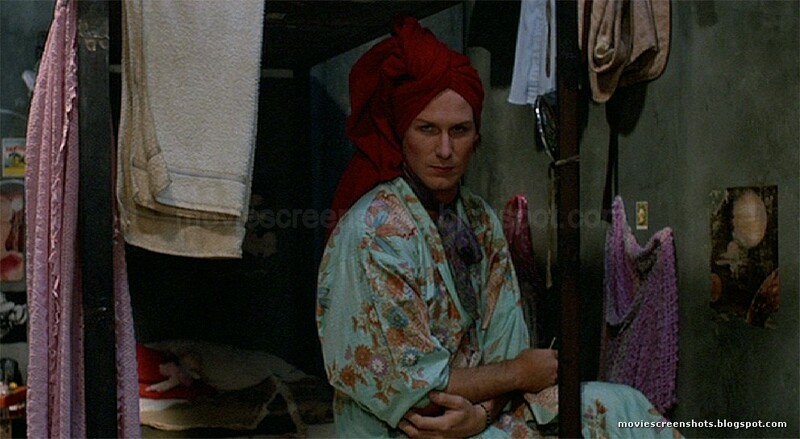 Good news for William Hurt, who was eventually cast in the role and won an Oscar for his portrayal (the first gay character to win the award). In a South American prison are two men. 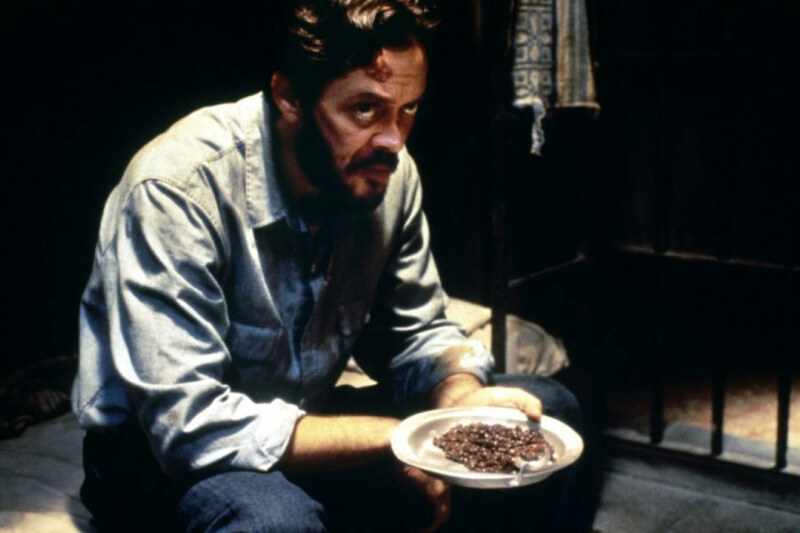 One, Valentin Arregui (Raul Julia), is a political prisoner, imprisoned for his left-wing political views by the right wing government. He is constantly being tortured and interrogated by he prison officials trying to get to who is at the core of his faction, so they can arrest his confidantes. The other prisoner in his cell is Luis Molina, a homosexual. He is not imprisoned for his homosexuality so much as for the fact that he had sexual relations with a minor. At least that is the reason that is stated. To be sure he has homosexual friends, and none of them are imprisoned (at least we don't find out that any of hem are), so maybe homosexuality is tolerated, even if it is not condoned by the government. Luis passes the time with Valentin by relating the story of his favorite movie, one which Luis regards as a beautiful love story, but one that, to Valentin's disgust, is obviously a Nazi propaganda film. In it, the main character, played by Sonia Braga, is hopelessly in love with a member of the Nazi occupation force. At the same time she is being pressured by the resistance to use her position to get information from her lover. 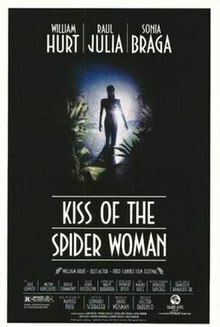 Although the plot of the film within the film is related by Luis, The vision we get of the woman must be from Valentin's mind because it is the same woman who is his lover in the outside world. Valentin is dual-minded in this regard. He truly loves his bourgeoisie lover, but he feels guilty because she is of the rich elite. Therefore he also has a girlfriend in the resistance, seeming to assuage his feelings of guilt. Luis' main goal at the outset is to try to get on the good side of Valentin. It seems he has been promised an early release from prison if he can somehow wangle from Valentin information on the political prisoner's core rebel group. Which Luis does for a while, but he has fallen in love with Valentin, despite Valentin's disgust with Luis' lack of interest in the socio-political world outside his own private world. Eventually Luis starts to work contrary to his purpose for the prison, extracting gifts from the prison officials, ostensibly from Luis' mother, in an effort to try to bring Valentin to good health. He becomes emotional at one point and expresses his love for Valentin, and Valentin himself becomes more accepting of his cellmate. The movie is not your typical drama, but it is engrossing to say the very least. You find yourself even becoming hopeful for a happy ending for the both of them. And when that happy ending doesn't materialize forthwith, even then you may find yourself satisfied with having watched the film, even if not entirely happy with the way it turns out for everybody. 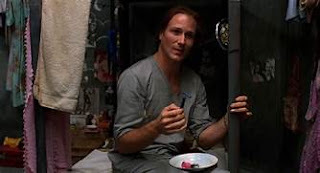 As stated above, William Hurt won the Oscar for his portrayal, one that could be seen forthcoming after such bravura performances in Altered States (his first movie) and The Big Chill and even to some extent in Body Heat, all made prior to this movie. Hurt went on to great roles and further Oscar noms in such movies as Children of a Lesser God, Broadcast News and A History of Violence. Raul Julia also could have been nominated for Best Actor, but wasn't. Personally I would have put him ahead of James Garner (for Murphy's Romance) in the list for voting, but I would probably have voted for Hurt anyway if I had been in the voting queue. Both actors make this a very good film to watch, but be forewarned it may not be good for the kiddos. Unless you are trying to give them an insight into the repressive side of politics, but even then I would suggest waiting until they are at least high school age. Drive home safely, folks. Be sure to tune in tomorrow for my second review for the blogathon, of The Birdcage. I love the idea of the worlds of politics and imagination that clash in these two characters. Watching two excellent actors do their thing when given well-written and challenging roles is thrilling. 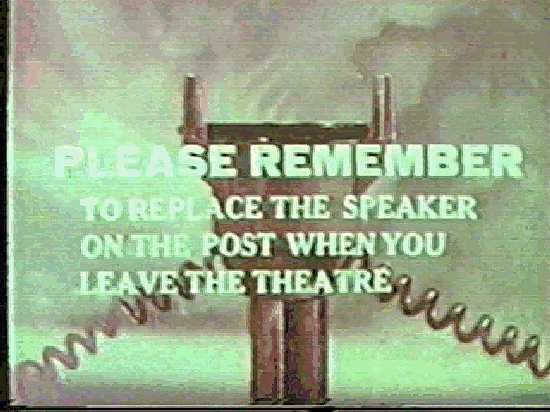 I never saw it until one afternoon on cable and found myself entranced by it. Thanks for reading. 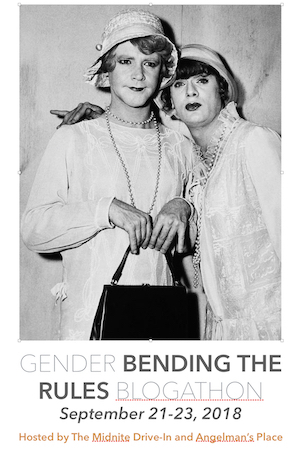 This is a beautiful film I have not seen for years and years. I LOVE Hurt's sensitive and realistic portrayal of the effeminate homosexual, but the amazing Raul Julia is just as powerful (I hope people remember him, he was such a STAR) and Sonia Braga is also iconic. Quiggy, what a great film to choose for our beloved Blogathon! Thank you for everything, my dear friend!! It was turned into a musical??? I wouldn't have thought the subject matter would lend itself to a musical... Thanks for reading. 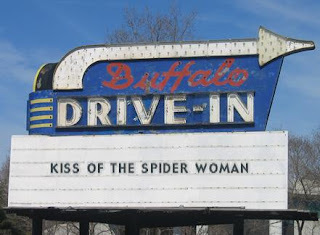 I haven't seen "Spider Woman" since it came out and I confess I wasn't too crazy about it then, but your write-up has intrigued me enough to want to give it another look -- I may enjoy it more the second time around. Thanks to you and Chris for this equally intriguing blogathon -- what a great idea! Hurt's performance (and Julia's too) make it fascinating for me. Thanks for reading. This film is so good - and I'm not biased because it has many connections wit Brazil. 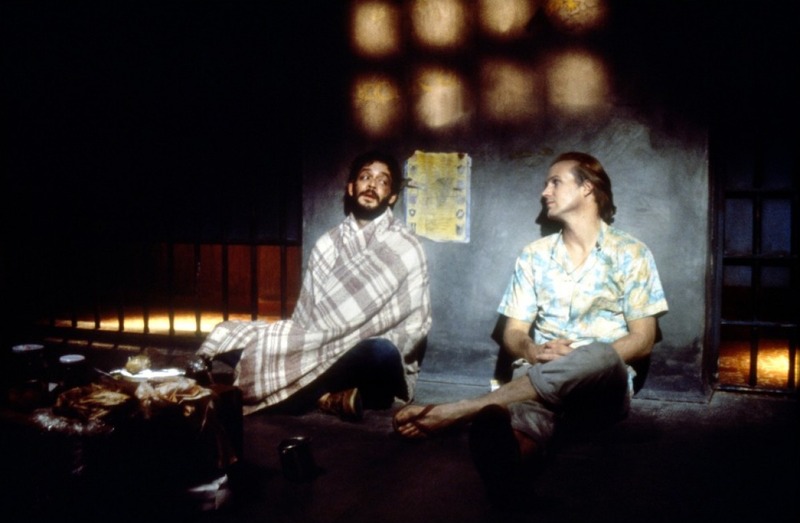 Raúl Julia and William Hurt are equally amazing in their roles. I also believe Julia deserved a nomination, even if the outcome was the same in the end. Great review!